From Jan. 18-20, Monterey Bay Aquarium and Stanford University are convening the world’s leading bluefin tuna researchers, policymakers and stakeholders for the Bluefin Futures Symposium in Monterey. Using the power of its global expertise and diverse perspectives, the group is exploring opportunities for international collaboration toward healthy and sustainable wild bluefin tuna populations across the world’s ocean. One of the symposium’s keynote speakers is Maria Damanaki, global managing director for oceans at The Nature Conservancy and former European Union Commissioner for Maritime Affairs and Fisheries. Maria Damanaki calls bluefin tunas “silver bullets.” The massive fish are some of the fastest creatures in the sea, tearing through the water in shimmery flashes beneath the waves. 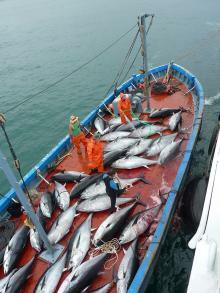 There is, unfortunately, no silver bullet to ensure that bluefin tunas are managed sustainably. A long history of overfishing the three major bluefin species reduced their numbers to very low levels, and regional management efforts over the past 50 years have had mixed results in recovering these stocks. The Pacific bluefin tuna population is still in decline, while the southern bluefin, and some populations of Atlantic bluefin, are seeing some improvements. Illustration of an Atlantic bluefin tuna. Courtesy of NOAA. Damanaki is optimistic that the Bluefin Futures Symposium will facilitate an honest dialogue among the diverse international interest groups and governments with stakes in bluefin tuna management. At the end of the day, she hopes there will be an encouraging outcome. As European Union Commissioner for Maritime Affairs and Fisheries from 2010 to 2015, Damanaki implemented a strict monitoring program for Atlantic bluefin populations in the Mediterranean Sea. Under her leadership, the European Commission cut the eastern Atlantic bluefin tuna catch quota by over 50 percent and restricted fishing to just one month per year. As a result, the population of eastern Atlantic bluefin tuna have shown signs of recovery. Still, Damanaki says, sustainable bluefin tuna management has a long way to go. The symposium represents an important step to establish effective and lasting international strategies by bringing together the key people who represent what Damanaki considers the five pillars of bluefin management: the fishing industry, science, policy, non-governmental organizations and technology. Global distribution of bluefin tunas. Graph courtesy Marine Conservation Science Institute. Damanaki hopes the science presented at the symposium will inspire additional research. One of the most pressing needs for each of the three bluefin species: improved population estimates. It’s not easy to count fish that move at fast speeds and travel long distances through the open ocean, even with help from advanced computer modeling. But it’s essential data for policymakers considering tradeoffs between short-term economic interests and long-term recovery of bluefin populations. Of course, a sustainable future for bluefin tunas depends on more than just data. Damanki says it’s critical for scientists, politicians, NGOs and industry to work together on this issue. And she stresses the importance of partnering with fishers by giving them incentives to cooperate.